Bronzing your baby shoes is one thing; bronzing in the garden indicates a problem. Bronzing refers to the way some leaves or fruit turn purplish or bronze-colored as a result of mineral imbalances, pest feeding, chemicals, environmental conditions, or disease. Bronzed leaves tend to be smaller than normal and the damaged areas are unable to perform photosynthesis. Bronzing damage may look similar to sunburn damage, except that sunburned leaves tend to turn grey, rather than bronze. Bronzed fruit has a dry, rough texture. Zinc deficiency - Rare in the Bay Area, zinc deficiencies appear as twig dieback (necrosis), yellowing (chlorosis), and leaf bronzing, often caused by too much phosphorus in the soil. This is more commonly seen in container plants. Copper deficiency - Rare, tends to make trees look more like shrubs than trees. Leaf bronzing, shoot, twig and needle dieback, and witches’ broom are common symptoms. Chlorine deficiency - More likely in sandy soils, symptoms include leaf bronzing, stunting, necrosis, chlorosis, and wilting. Manganese deficiency - Being relatively immobile within a plant, manganese deficiencies are usually seen in younger leaves. Manganese deficiencies look very similar to iron (Fe), magnesium (Mg), and nitrogen (N) deficiencies, with interveinal chlorosis and bronzing. Brown specks may also be visible. Sodium toxicity - Too much sodium can cause severe chlorosis, bronzing, and leaf drop. Stunting and other water stress symptoms are also common. 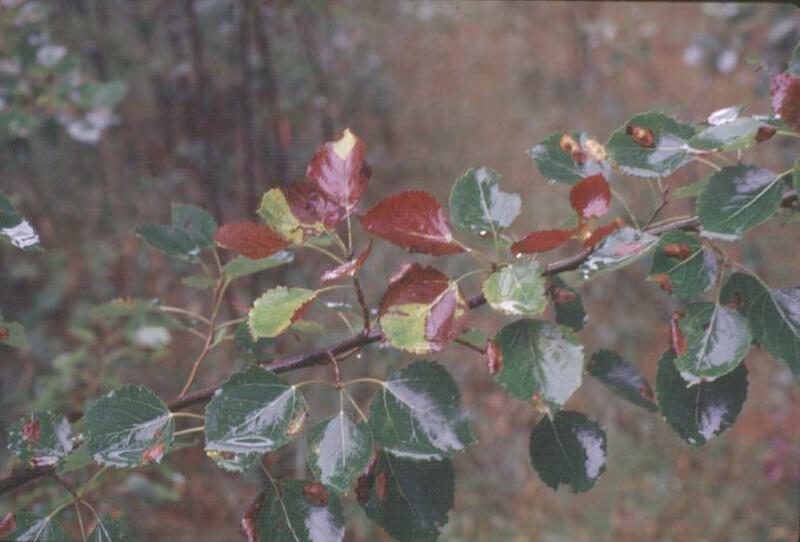 Iron toxicity - Iron toxicity normally appears as leaf bronzing and reddish spots. These symptoms are from iron oxidizing the chlorophyll used in photosynthesis. In the Bay Area’s heavy clay soil, we are more likely to have insufficient iron. Did you know that rice farmers rate plant varieties using leaf bronzing scores (LBS)? Apparently, rice varieties are scored on their ability to tolerate excessive iron in the soil. Mites can cause leaf stippling and bronzing. Fruit can also take on a russet, bronzed appearance. Nematode feeding may cause bronzing and stunted growth of boxwood. Thrips may cause bronzing and downward leaf curling of lettuce, strawberries, blueberry, boxwood, and many other plants. Aphids, scale insects, and whiteflies may also cause bronzing. Chemical damage can occur when herbicides, pesticides, and fungicides, such as sulfur, are applied incorrectly. Also, the wind can carry herbicides and other chemicals from neighboring gardens and yards that may cause leaf bronzing. If you see bronzing, necrosis, interveinal chlorosis, desiccation, and distorted growth, it may be chemical misuse or overspray. Air pollution often causes high levels of ozone (O3) in the atmosphere. Ozone, combined with high temperatures and bright sunlight, can cause purple-brown discoloration, or bronzing, on the upper surface of leaves. This is particularly common, in the Bay Area, on bean plants. There are many plant diseases that include bronzing as a symptom. Some of these diseases include spotted tomato wilt (carried by thrips), phomopsis stem canker in sunflowers, alfalfa mosaic, cotton root rot, and blueberry bronze leaf curl. Use bronzing as a clue when you walk through your garden. The brownish or purplish discoloration of bronzing is a clear sign that something is amiss.